I have long wondered if and when New York’s young workers, tired of low wages (or permanent freelancing or “internships”), squeezed by rising rents into living more than one to an apartment or even a room, faced with higher taxes that contribute to those rents, facing squeezes on the subway and diminished public services, would decide they have had enough. And realize there will be no pot of gold at the end of the rainbow like the ones prior generations received. No rent regulated or Mitchell Lama apartment, no owner-occupied unit purchased outside a housing bubble or at an “insider” price in a conversion, no stable job with benefits, no improving schools. Just higher taxes and deteriorating services to pay for those dead and gone or retired to Florida. would slow, stop, and reverse. And based on data I downloaded Friday for a report I’ll be writing Monday on the job, it may have started to happen. The data used in this post can be found in this spreadsheet. 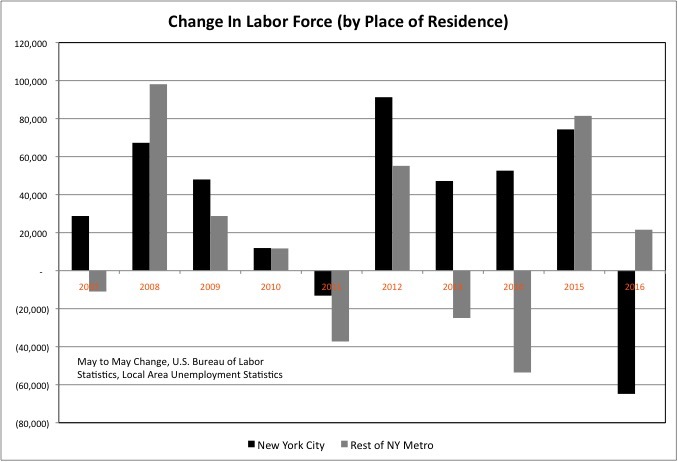 What I noticed is that after an incredible boom, one that far outpaced the rest of the New York metropolitan area and the rest of the U.S., the number of employed residents of New York City (including the self-employed and those who commute out to the suburbs) actually fell from May 2015 to May 2016. The number of employed residents of the suburbs (including the self-employed and those who commute into NYC) continued to increase, but at a slower pace. This followed a decade during which employed people were increasingly concentrated in New York City relative to the suburbs, where many aging suburbanites were retiring. This data can be volatile, and three months from now the prior pattern may reassert itself. 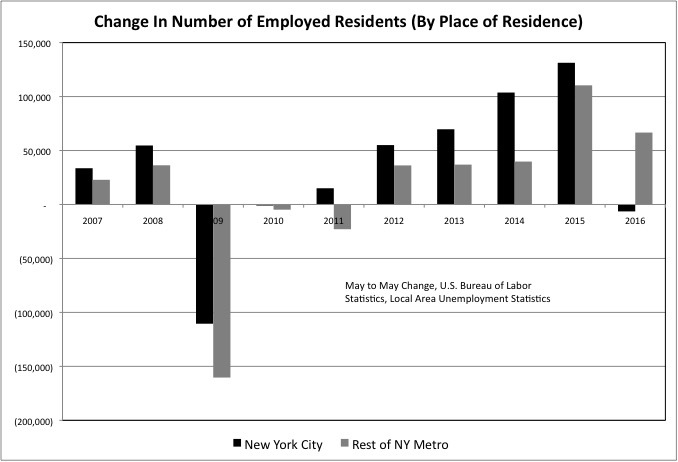 The number of employed residents of NYC, moreover, only fell by about 6,400 (0.2%) in the year to May 2016, compared with an increase of 66,645 (1.2%) for the rest of the NY Metro area. In the year to May 2015, the number of employed residents had increased by a stunning 131,300 (3.4%) in New York City, and a solid (110,400 (2.0%) in the rest of the NY Metro area. Still, pending additional data one could speculate that this could be the beginning of a major reversal. And start to wonder what it means. It doesn’t necessarily mean that city residents are losing jobs, and suburbanites are gaining them. The fact is unemployment is falling in the city and suburbs alike. It is more likely, rather, that fewer people with jobs are living in the city, and more people with jobs are living in the suburbs. Perhaps aging suburbanites are leaving, retiring elsewhere, and selling their homes to city residents who are moving out to places with better schools. It has long been the pattern that the married and employed leave the city when their children reach school age, driven out by the NYC schools and the smaller average size of its housing units. Only about one-third of NYC housing units have more than two bedrooms, compared with two-thirds nationally, and it is smaller units that have been built recently. This pattern had seemed to slow in the past decade, with the “Millennial” generation choosing to stay in the city as parents in far greater numbers than their Baby Boom predecessors. With soaring housing prices, however, perhaps more members of the latest generation of young workers have decided that even if they want to stay in New York City, they cannot afford to. If the data proves to be more than a blip, the metro area’s employed residents may be shifting to the suburbs even as private sector wage and salary employment is increasingly concentrated in New York City. Based on the survey of employers, the number of people with wage and salary jobs who are working in New York City continues to increase faster than the number of people with wage and salary jobs who are working in the rest of the Metro area. Although in both places the number of jobs added from May 2015 to May 2016 is smaller than in previous recent May to May periods. Has this pattern, the number of jobs soaring in the city even as jobholders shift to the suburbs, been seen before in metro New York before? Yes, in the run-up to what had for decades been New York City’s private employment peak, from 1965 to 1969, in the administration of Mayor Lindsay. Back then first married workers, and then (after 1969) businesses, fled to the suburbs to escape the soaring taxes, collapsing public services, and deteriorating infrastructure of New York City. The result of retroactively enriched pensions, rising debts, and increasing social services costs. At least with regard to the debts and retroactive pension increases the city and state policies of the 1960s have been repeated. But not just in New York City this time, but in the suburbs as well, here and elsewhere in the country. Suburbs that now face a spiral of tax increases and service cuts of their own as I wrote here. That’s the difference between the 1970s and today. It might once again make sense to flee New York City, but there are fewer places to flee to. Particularly with the same kind of infrastructure decline affecting the suburbs (here and elsewhere in the country), and the link between the suburbs and the city. And the scourge of poverty, drug addiction, and tax base loss moving into what had been middle class suburbs as they reach 50 years of age. Here is the most stunning reversal. The New York City labor force, which is the number of employed residents either working or looking for work, plunged by about 64,800 (1.5%) from May 2015 to May 2016, according to the latest estimate. Prior to that it was the suburban labor force that had been stagnant while the city labor force was soaring, even in the face of higher housing costs and unemployment. But the suburban labor force is still stagnant, with an increase of just 21,555 (0.4%) in the year to May. Which means that the economically active population of metro New York as a whole fell by about 43,300 (0.4%). This is a trend I have observed a great deal over the past few months, as I write about the economy and commercial real estate market of metro areas around the country (starting each quarter with New York and ending with Wichita). With the Baby Boomers exiting the labor force, and young workers moving away from the areas that have offered the least economic opportunity over the past 20 years, more and more metro areas have a shrinking labor force. As the labor market reaches full employment – an unemployment rate below 5.0% — employment growth is stalling not so much due to a shortage of jobs, but rather due to a shortage of workers to fill them. The result, in many places, is more and more entitled retirees with fewer, poorer workers to support them. New York City had been one of the few winners with regard to this economic trend, one of the places where young workers, who pay taxes but require relatively few public services, were concentrating. To the benefit of the New York City and State budgets. And paying higher rents despite lower wages. Now, however, this national trend may have reached metro New York. 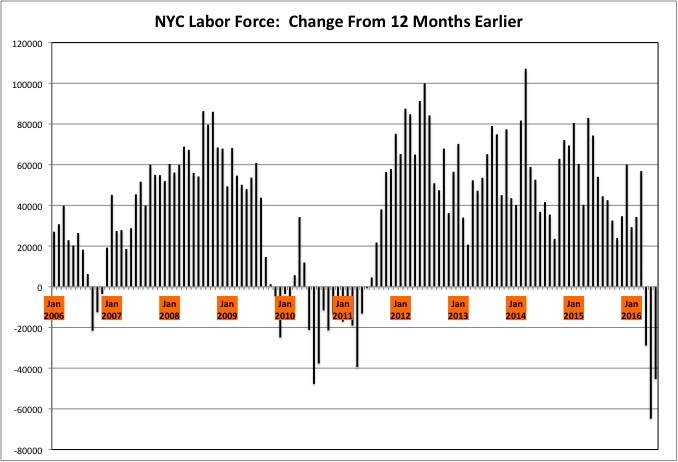 New York City’s labor force growth stalled once before recently, in 2010 and 2011, before accelerating again. But May 2016 is just one of three recent months when the Bureau of Labor Statistics believes the city’s labor force was smaller than a year earlier. Given that these three months are April, May and June one reason might be fewer college and graduate school graduates coming here to take the place of those who leave. If more workers continue to leave New York City than new ones arriving employment will eventually stop growing. That L train shutdown? The additional tax increases and service cuts already baked in with the labor contracts the DeBlasio Administration has already signed? Don’t count on the young serfs toughing it out, moving to other NYC neighborhoods, or even moving to the suburbs. They may exit metro New York altogether. Nationally we may be finally heading for an economy I had expected several years ago – plenty of jobs, or at least freelance positions or internships, but at a compensation level far lower than prior generations received, on average, at the same point in their careers. Might businesses respond to growing labor shortages by raising wages? They don’t want to, because they don’t want to settle for lower profits or executive pay and they can’t raise prices. Because their customers – the same workers – are broke, thanks to high debts, lower wages, and inadequate retirement savings. And they don’t have to because the number of new firms, and competition in business, are going down. Instead of paying more to attract more workers, these oligopolies will cut the hours they are open, downsize, reduce the quality of their produce or service, or exit markets altogether. What if the millennials are, in fact, leaving NYC and buying into the suburbs? I continue to argue against it. Once you buy, you are stuck. Stuck with the property tax increases, service cuts, and community deterioration Generation Greed plans on cashing out and leaving you with. They are counting on younger people not really understanding what is coming, and being suckers. Instead of only being willing to pay a price that is so low that it takes back in lower housing costs all the community deficiencies that are being left behind. Generation Greed isn’t willing to sell at that price. Yet. The government is helping them, inflating the price of their houses (and stocks) with zero interest rates and other policies, and hiding the full burden of past public policies. It’s a war of attrition. Once the tax increases and service cuts can’t be put off anymore, however, housing prices will start to reflect them. A premium for ownership reflects two things: the ability to lock in housing prices, regardless of any inflation in the economy, and to become a permanent part of a community. That’s why people have been typically willing to pay more to own than to rent – rents could rise, but the mortgage payment is fixed and – if one pays the mortgage off – eventually disappears. A premium for renting reflects two things: the ability to benefit from falling housing prices in the long run (even though rents have been rising more than income in the recent past), and the ability to flee a community if it deteriorates and taxes rise. Because even after you pay off the mortgage, those taxes remain. The community has become a wealth transfer mechanism from young people who can’t run away to Generation Greed, which feels entitled to everything it promised itself but refused to pay for. If you are locked in you are set up to be a victim and pay the debts, underfunded and retroactively enriched pensions, and deteriorating infrastructure left behind by those who came before. Unless you pay so little up front that it offsets any possible disadvantage. I heard yesterday from a friend of my older daughter, who has joined many of her other classmates in leaving metro New York, in her case for a PhD program at Washington University in St. Louis. She said that many of her new classmates are buying houses there just to use for six years, because houses are so cheap in St. Louis that doing so is cheaper than renting. It will take more data to confirm this, but the young serfs may have started to leave New York or at least stop coming here in large numbers. Where they will go instead remains to be seen. Update: the labor force also fell in Los Angeles County, albeit not by as much as in NYC, and that area is also at full employment. With a big year-over-year gain in employed residents that seems not to be repeated unless there is some way to squeeze more workers into the area.